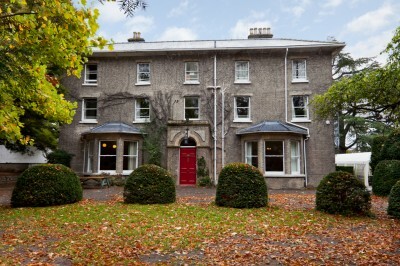 Burwell House provides a fantastic self catering venue. Our grand, 18th Century house and large garden offer a comfortable, affordable, flexible and relaxing self catering venue which can be used in many different ways to ensure the success of your event. Downstairs there are 2 lounges and one ‘classroom’ – each suitable as social spaces, meeting rooms, rehearsal rooms or other activity space. There are also a number of ‘satellite’ buildings, including a craft studio. The house is wifi enabled, and TV and DVD facilities are provided. The house has up to 62 beds in 11 rooms – 7 of which contain bunk beds. There are a total of 37 lower bunks or single beds within this number. In addition, one of our downstairs lounge rooms can be converted to a downstairs bedroom for up to 6 people if required. This is particularly useful for any participants with mobility issues for whom the stairs might be difficult. On occasion groups have supplemented the sleeping facilities by having course participants camp or caravan in the garden. This can also sometimes be possible. Large, professionally equipped kitchen, with large ovens, hobs and hot cupboards and plenty of fridge, freezer and food preparation space. There are a number of food outlets in Burwell village and it is also sometimes possible for our catering staff to come in and provide a part-catered service during your stay. 3 acres of landscaped gardens surround the property, containing much of interest, and a fantastic area for adults and children to relax, play and explore. It contains large open lawns, an orchard, a meadow area, a wildlife pond and many seating areas, including 2 large gazebos. In addition there is a large secure car park for up to 30 vehicles. 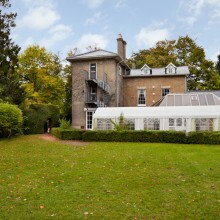 Located 10 miles to the NE of Cambridge, Burwell House is very easily accessible via the A14 and A11. This makes us within an hours drive of the whole of East Anglia and much of North London. We are within 20 minutes drive of Newmarket and Ely railway stations, and are directly on a bus route from Cambridge. The village of Burwell itself retains a peaceful and friendly atmosphere. It has a number of good pubs and takeaways and a great coffee shop, as well as small supermarkets, petrtol station, chemist, and churches. Surrounding the Centre are a number of country walks. There are also a number of nearby visitor attractions, such as the fantastic National Trust properties of Anglesey Abbey and Wicken Fen. The Centre holds group membership of the National Trust and therefore groups staying with us may be able to get free access to these properties. Our standard price is for a 48 hour stay, usually from 4 – 5pm on Day 1 until a similar time on Day 3. However, this can be flexible. This cost is fully inclusive of all administration and backup, and of all bed linen. This also guarantees full, sole group access to the house and grounds. For groups wishing to stay for longer than 2 nights please get in touch with us for a quotation. Self Catering – terms of hire. As one of Cambridgeshire County Council’s learning services, the principal reason for our existence is to work with and support groups of children, young people and adults with a learning or training focus. However, as a self-funded trading service we are keen to make full use of our facility in whatever way we can. 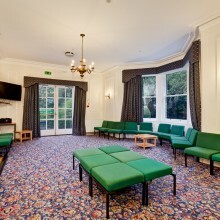 We are regularly used by groups looking for a wonderful weekend or holiday venue – for music and drama rehearsal/performance, religious and spiritual retreat, and for social gatherings. Any groups using our Centre will be asked about their intended usage of our site – and we will need to ensure that this doesn’t contravene the council values of equity, respect and integrity before accepting any booking. In addition to this, with the main focus of our Centre in mind, and with our location in the middle of a residential neighbourhood, we ask that all visiting groups don’t act or behave in any way which might cause problems to us. This includes unnecessary or unacceptable levels of late night, outdoor noise. For these reasons also, we are not normally a suitable venue for loud parties or for hen or stag weekends.